On the campus of Hamilton Medical Center in Dalton, Jenna Early, near left, checks the blood pressure of Ladashja Roberts at Med Camp, a Dalton Public Schools, Mercer University School of Medicine, Dalton State College and Hamilton Medical Center sponsored event for rising 9th grade Dalton students on Wednesday. In back, Nadia Fajardo, top, listens to the lungs of Celina Mendez. 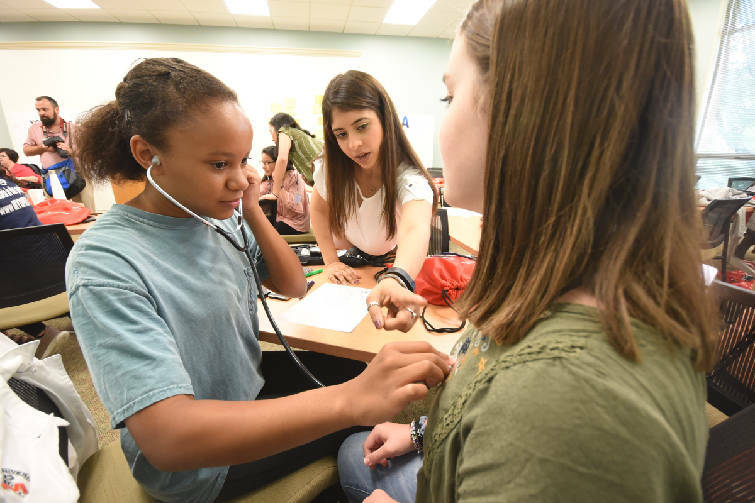 Sehar Lalani, center, a second year med student at Mercer University School of Medicine, directs Trinity Mouzon, left, where to listen to the lung function of Macie Elrod, a rising 9th grader at Dalton Middle School Wednesday during Med Camp. Under the direction of Heather Sliger, Dalton Public Schools, Mercer University School of Medicine, Dalton State College and Hamilton Medical Center sponsored the event. Sliger teaches introduction to health care science at Dalton Middle. DALTON, Ga. — Jenna Early wants to be an orthopedic surgeon. But first, she needs to nail down the basics. "This," said her friend, 14-year-old Ladashja Roberts, forming both her hands into Ls, lifting them to eye level and nodding at one of them, "is my left." The girls giggled. Early, 14, sat behind Roberts on Wednesday morning in Hamilton Medical Center's Winkler Health Education Building, where Dalton Public Schools hosted its first Med Camp for rising freshmen. The girls — and about 28 other students — were examining each other's hearts and lungs with stethoscopes. An instructor told Early to listen to Roberts' lungs on the left side. But as she gripped the stethoscope's diaphragm, Early became confused for a second: Is my left side her left side? When you're 14, a one-second hiccup is one second too long. Roberts immediately formed the Ls, loudly and bluntly explaining the difference between left and right. Early recovered and listened to Roberts' lungs. Across the room, other girls — and almost all the students were girls — practiced on each other. In one corner, 13-year-old Paulina Paramo wrapped the cuff of a sphygmomanometer (the device that measures blood pressure) around 14-year-old Jacky Ayala's arm. Paramo wants to be a pediatric surgeon. Ayala wants to be a pediatrician. Paramo pumped the inflation bulb furiously, squeezing the grip around Ayala's arm. "It's too tight," Ayala yelled, laughing. "Ow! Ow!" The girls then walked across the building, to a room where a nurse explained what to do if their friends started losing blood at a life-threatening rate. 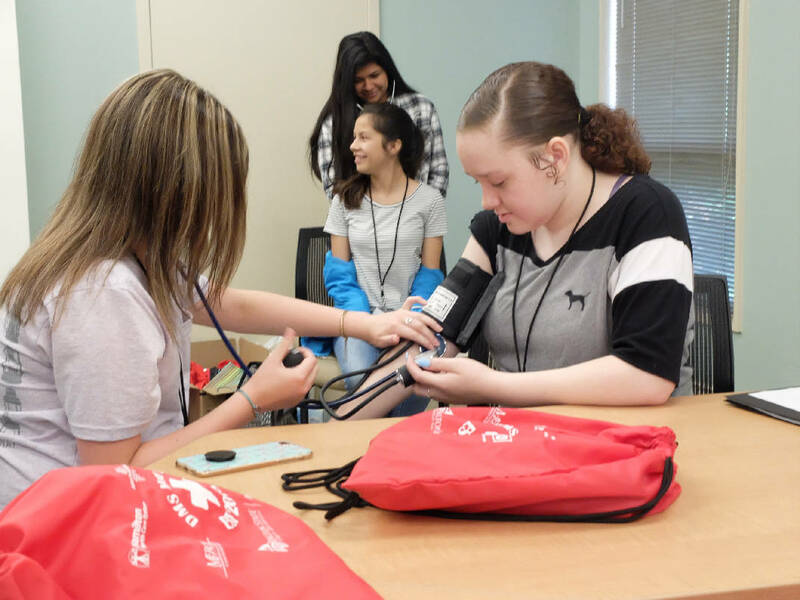 Med Camp, which began Monday and ends today, is part of a partnership among Dalton Public Schools, Dalton State College, Hamilton Medical Center and the Mercer University School of Medicine. Medical students from the university have worked with the teenagers during the camp this week. The first piece of the partnership was the launch of an Introduction to Healthcare Science and Technology course at Dalton Middle School last fall. The class, taught by former X-ray technician Heather Sliger, teaches children about different jobs in the medical field. These can range from doctors and nurses to, more specifically, forensic science, pharmacy and emergency services. Sixth- and seventh-grade students were required to take the course last year for nine weeks. Eighth graders could sign up for an elective taught by Sliger, lasting one semester. This week's Med Camp students came from that batch of eighth graders, Sliger said. Before joining Dalton Public Schools, Sliger worked as an X-ray tech in catheterization labs for about 14 years. But on Oct. 3, 2013, she drove near Rome, Georgia, when another driver crossed the center line. "I took a breath," she said, "and I knew she was fixing to hit me." She suffered a burst fracture in her spine from the head-on crash. During surgery, she lost part of her L3 vertebrae. She could no longer wear the lead shielding she needed on her body to protect her in the lab. She left the job and joined Dalton Public Schools in 2015, heading up Blue Ridge Elementary School's Science, Technology, Engineering and Math lab for two years. She said she was always a meticulous mentor with younger techs at hospitals, and she took quickly to teaching. Still, she said, the new job at the middle school was a better fit. She enjoyed sharing more advanced concepts. The next step of the partnership begins this fall, when Dalton High School launches an Intro to Healthcare class. Though not restricted to freshmen, the class is supposed to help the recently-departed middle school students take another step in the program. More than 100 student have registered for the class, said Jennifer Phinney, director of school support. She expects the high school to add another class next year with a focus on sports medicine and exercise science. She also hopes students will begin to work at the local hospital. "We'll kind of build this as we go," she said. "We'll add a class each year. "On Wednesday, after practice with the stethoscopes, instructors brought the students to Dalton State College's simulation lab, where they could listen to the heart and lungs of a robotic mannequin. Instructors can tweak it to show signs of COPD, asthma or other breathing problems. Today, the camp wraps up at the Bradley Wellness Center, where instructors will show them athletic training and rehabilitation activities.